This tutorial creates a burst particle effect, which means at the end we’ll need to use ParticleEmitter/Emit to spawn many particles at the same time. We can use the Command Bar to call the method while working, but the default ParticleEmitter/Rate of emission will suffice for previewing particles. At a certain point, we’ll turn this off (set ParticleEmitter/Rate to 0) in favor of using the Emit method. At the moment, there’s no native Studio tool to emit a burst of particles, but you can create or install a Roblox Studio plugin to allow this. Under the Home tab in the Insert section, insert a Part. Under the Model tab in the Constraints section, select Attachment. 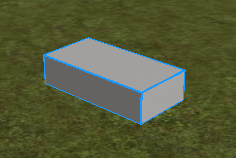 With that tool selected, click once in the game view to create an Attachment object. In the Explorer window, notice how the object has been parented to the Part. In the Properties window, set the Attachment’s Position to 0, 15, 0. This is the position of the Attachment relative to the parent Part. We want the attachment somewhat high off the ground. Next, add a ParticleEmitter to the Attachment. Select the Attachment, then press CTRL+I to open the Advanced Objects menu. Type “particle” and find ParticleEmitter to insert it. Since the ParticleEmitter is within the Attachment, the particles will be emit from the attachment point. Fireworks are short-lived particles. We begin editing the ParticleEmitter by change its ParticleEmitter/Lifetime to 2, 3 so particles last somewhere between 2 and 3 seconds. By default, this property is 0, 0 so there is no variation in direction. The particles should shoot straight upward. Setting it to 90, 90 will create a half-sphere shape, as it will apply the spread on both angles. Next, set the ParticleEmitter’s ParticleEmitter/Speed to 30 and ParticleEmitter/Drag to 5. This will cause the particles to fly out fast then decelerate quickly. To simulate gravity, set ParticleEmitter/Acceleration to 0, -5, 0. Next let’s decide on how the particles are to look. Start by setting the ParticleEmitter’s ParticleEmitter/LightEmission to 1 so the particles’ colors blend additively. Also set the ParticleEmitter/LightInfluence to 0 so the particles aren’t made dark by the night sky! Particles should fade out only toward the end of the particles’ lifetimes. Select the ParticleEmitter’s ParticleEmitter/Transparency then press the […] button to open a graph. Add a stop at Time = 0.5 in the center by clicking. Set its value to 0. Raise the end stop (at Time = 1) to 1. Since this is a burst particle effect, set ParticleEmitter/Enabled to false on each ParticleEmitter. You can also set Rate to 0. Tip: You can select all the ParticleEmitters by holding CTRL and left clicking each emitter in the Explorer. To preview the result, you’ll need to emit particles on all the emitters at once. To do this, type (or copy and paste) the following command in the Command Bar and press enter. When all is said and done, you should have a nice exciting firework effect!